The fist week of lessons on the Non Stop Ski Instructor Course were amazing. I really enjoyed every minute of it. Even being soaking wet in the rain on Friday! I already feel that my skiing ability have improved dramatically and can’t wait to learn even more! Lessons from Week 1: Make sure your clothes is waterproof! We continued to work on all kinds of exercises to improve our balance through out the week. A big AHA moment for me was when I started to “force” my upper body to face downhill all the time. As our technique improves it is becoming increasing easily to make fast turns. On Wednesday we did video analysis of our skiing. It was interesting seeing yourself skiing. The amazing thing is that my own perception and what I saw on the screen did not match up. Axelle gave us some great feedback as part of the video analysis and help us practice it for the rest of the day. There has been very little fresh snow, the last few weeks, but since Wednesday night it has been snowing on and off. Friday was our first lesson day in a bit of powder! We had soooo much fun, playing through the trees, searching for moguls and just having a blast! Your core strength is just as important as you leg strength. You stomach muscle need to be strong to help you stay balanced no matter what the conditions throw at you. It is amazing the increased endurance you can get out of your body by being as efficient as possible when you ski. The better our technique gets the longer we can hopefully endure. The shapes of your ski’s will help you complete the turn with the right technique. Friday our clothing was tested to the maximum with pouring rain at the bottom of the hill. Luckily only the outer layers got wet and neither of us felt cold at all. So this weekend we tried to waterproof everything to hopefully keep the outsides dry next time we meet the rain. This week I also bought myself some powder skis, and got to play with them a little on Thursday! They are awesome! Looking forward to do the cat skiing with them! Tomorrow we start week 2! Can’t wait! This entry was posted in Fernie, Nonstop Ski Instructors Course on 2013/01/28 by Justinus. Grocery shopping doesn’t change much when you’re in another country, you have to make a list and walk the aisle. 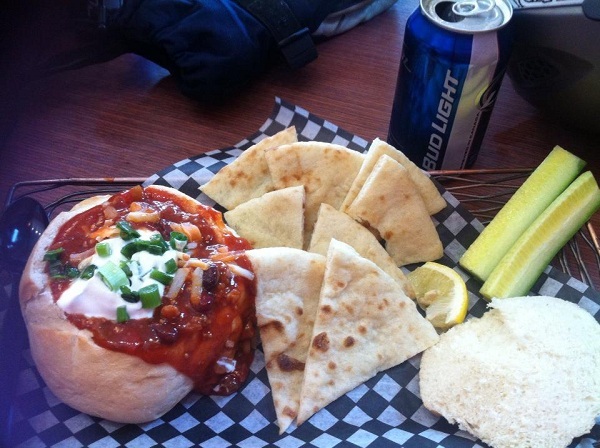 In Fernie we buy, eat, drink and enjoy! There are mainly two grocery stores in Fernie; Overwaitea and Extra Foods. Overwaitea is much closer to home and we earn points there, so it’s where we do our weekly groceries shopping. Like most people in Fernie the staff is super friendly and helpful. The store is very clean and neat, light and bright. The fruits are shiny and of good quality and the veggies very fresh, we buy about 30 apples and 20 bananas a week! Some products have the same look, but there are a lot of unfamiliar products, to me at least. Good old pampers are on the shelves, so that’s no brainer! Justinus and Jano loved the Maltezers (chocolate balls), and we’ve bought a lot of those!! Other products we love are the lemonade and flapjack ready mix (it’s called pancakes here). The liquor store stock fine South African wines and beers and we’ve also bought a bottle of Amarula, divine with crushed ice. It seems that Christopher is over his diary allergy, so buying food has also become a bit easier. He is just on soya milk, lactose free yoghurt and margarine. Converting Canadian dollars to South African Rand….. At first glance prices sounds like a bargain, 3.49 for bread, then thinking about it R35! My goodness, everything seems very expensive, especially the cheese. I guess we will go back home and be thankful that things are so cheap! At the moment, I’m buying were we get points, sale prices, marked downs and comparing like mad, but I guess it won’t take long before we are used to it, like everything in life. Buying bulk definitely saves a lot of money, many products come in bulk. And after a week of consuming food, we’ve already opted to buy the 2kg peanut butter, 1.5 liter tomato sauce, the biggest cereal packs, 2kg mince pack (looks like a big roll of cold meat) and 4litres of milk as it’s much cheaper per unit, hooked already! Our menu hasn’t changed much. Justinus and Eunice make the big breakfasts three times a week. Lunch is a sandwich or we eat on the ski hill. A personal favourite is the chilli soup in bread bowl at the Lost Boys Café (just as you get of Timber Bowl Express chair lift). We’ve also enjoyed scrumptious pork ribs and burgers at Kelsey’s on the hill. Dinners are basically fish, rotisserie chicken, spaghetti bolognaise, tuna pasta, readymade lasagna, and since Kerry made her delicious fettuccini, it has been incorporated in our menu. I recently bought a readymade beef roast which was very yummy, the meat was so tender it fell apart! The pork chop recipe I googled was also very good. We combine it with veggies and/or salad that Eunice makes; either a chef’s salad or juicy carrot salad. Friday nights have always been our family night with Nando’s, popcorn and jelly babies and a movie for the kids. Since there’s no Nando’s here (in Calgary though! ), we’ve been eating Boston Pizza’s BBQ Chicken and Pepperoni pizzas, it is bursting with flavor! The other alternative, McDonalds, was Christopher’s request (just because he gets a kids toy)! Hot Chocolate with cream is also a big favourite! We eat a lot more here; we assume that it is due to the colder temperature, being very active and being in a holiday spirit. Whatever the reason, eating has always been a pleasant experience! Cheers for now from Ankie – Go buy, eat, drink and enjoy! This entry was posted in Fernie, Settling in on 2013/01/28 by Justinus. The first day on the Non Stop course was awesome! We had 4 hours of pure bliss on a beautiful sunny day. Axelle, our instructor in the morning, was energized and got us into the swing of things quickly. We did lots of exercises to help us focus on and better understand balancing on our skis. With each of these exercises we had to go to the extremes as much as we could. If we had to make turn with our centre of gravity as far forward as possible and then with it as far back as possible, then high and low. It was all about getting the balance right. 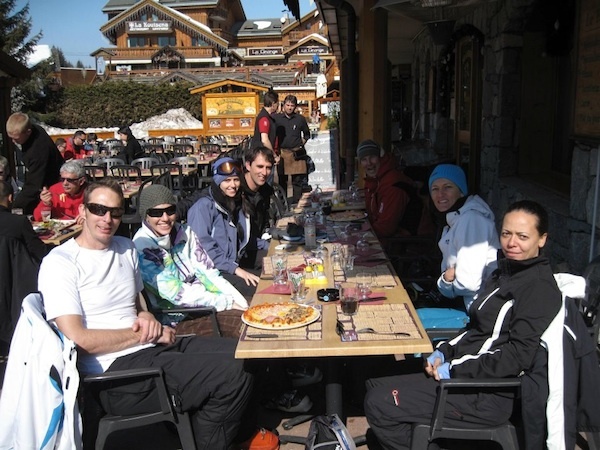 Our first day on the Non Stop Ski instructor course was nice and sunny! The idea was to experiment and find where skiing worked best. It is like the ‘Get Real’ and ‘Lean Startup’ approach to start a business. Just get a MVP (minimum viable product) out there and experiment, learn what works best and get better from there! I love it! As part of the process for the instructors to make sure all the groups’ ability are well matched, they decided to switched instructors in the afternoon. So this afternoon we were with Michelle. We did another bunch of exercises, with the same approach. The one I enjoyed was digging our poles into the ground while holding them half way down. This forced us to not use our upper bodies to make the turns. So far the organization from Non Stop have been flawless. Harriet, Christy, Max, Adam and Dave have been awesome. Dave said something very interesting tonight: “we should consider ourselves athletes”. Since we train 5-6 hours a day 5-6 days a week, we are in fact training as much as professional athletes. Everyday will hopefully be the best day ever! Today was all about getting the balance right. What will tomorrow hold? This entry was posted in Fernie, Nonstop Ski Instructors Course on 2013/01/22 by Justinus. Pumped up and ready to GO! It was in March of 2012 just after I decided to leave Private Property that the thought of doing a ski instructor course first occurred. Now the day has finally arrived. Tonight was the welcome dinner and tomorrow we will hit the slopes for our first lesson. I am sooo excited I can hardly sit still. Ahead of me lies 11 weeks of intense learning and practice. Four days a week, we will have instruction for 5 hours. That means that at the end of the course I would have had more than 200 hours of lessons. Ankie will be doing the 5 weeks course. After 5 weeks we will hopefully both be Level 1 CSIA qualification. And after 12 weeks I will hopefully have completed level 2 CSIA. We met our groups tonight as well as our instructors. And from what we have heard both our initial instructors seems to be a perfect fit for where we are in terms of our own skiing ability and state of mind! The Nonstop guys have clearly been doing this for a while and know how to split up the groups. The total group of people is quite big, probably close to 100 including the skiers and snowboarders on the 5 and 11-week courses. This is going to be EPIC! I remember when I was about 9 years old, being so excited about the first rugby game of my life that I got sick and could not sleep the night before. I can’t imagine that I was any more excited about it, than what I am about this ski instructor course. Here is to everybody that managed to get through a very difficult life changing decision, and never looked back. I hope you also get so excited about what every new day brings, that it is impossible to image where the other road would have led. We are pumped up and ready to go! 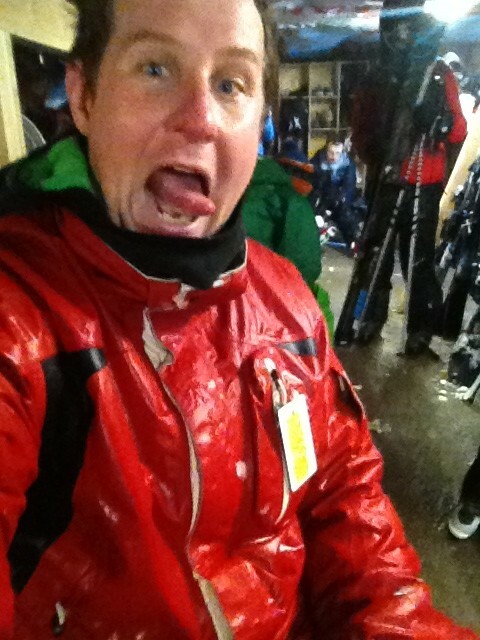 This entry was posted in Nonstop Ski Instructors Course on 2013/01/21 by Justinus. Many people have encouraged me to read The Art of the Start by Guy Kawasaki. Although I didn’t find the first few chapters to fascinating, the latter chapters made up for it. I found most value in the parts covering recruiting and bootstrapping. Overall I found very good value in The Art of the Start and would recommend it to anybody about to take the dive into entrepreneurship. It would be well used as a manual to starting a new venture. Each chapter in The Art of the Start concludes with a few FAQ, which offered some additional insight. There are also topical mini chapters interwoven into The Art of the Start like: The art of designing T-shirts. I got some great book suggestions from the recommended reading at the end of every chapter. The Art of the Start is divided into five main parts: Causation, Articulation, Activation, Proliferation and Obligation. Kawasaki starts The Art of the Start with what he believes the 5 most important things entrepreneurs have to accomplish: Make Meaning, Make Mantra, Get Going, Define your Business Model and Weave a MAT. It is a relatively fresh approach for me, but I think I have had an overdose of books on the vision and mission side of business. Which is probably why this was the least appealing part of The Art of the Start to me. Kawasaki argues that the positioning of an organization should explain why the founders started it, why customer should support it and why employees should work there. Which is related to the three golden circles Simon Sinek refers to in Start with Why. When trying to raise money most entrepreneurs’ lives consist of pitching day in and day out. The advice offered on pitching is very practical and should help anybody taking that route. I have come to the conclusion that business plans are mostly a waste of time and effort. While Kawasaki accepts that the actual plan is more or less worthless, he makes a case that the process adds value to a startup by forcing it to answer some of the tough questions. As well as getting the founders in each other’s faces, this result in either confirmation that they are a good team or that they aren’t. This was by far my favourite part of The Art of the Start. In my next business I am going to do my best to bootstrap all the way. I learned a great deal in the chapter on bootstrapping to help me when the time comes. Kawasaki gives five characteristics of a bootstrappable business model: Low up-front capital, short sales cycles, short payment terms, recurring revenue, word-of-mouth advertising. Those are great clues to look out for. The recommendations Kawasaki offered in the chapter on recruitment was my favourite. He gives tips on doing the reference checks like that it is better to do them earlier in the process. He also discusses the conflict I have often felt between my intuition and the qualifications of a candidate. There is also a table to decipher some of the lies often told by prospective employees. If you only read one chapter in this book, I would go for this one. The Art of Raising Capital starts off with some great advice: focus on building a business not raising money. There are wonderful insights in this chapter. I am sure allot of people would prefer this chapter, but my attention is more turned to bootstrapping so I was not fully engaged. A very entertaining part was the 10 lies entrepreneurs tell investors. For startups it always looks attractive to partner with a big company that could help shorten the road to success, but this road is full of potholes. Kawasaki offers tips on helping to navigate the potholes and also includes a table to decode big company ‘speak’. The best part of the branding is his advice on recruiting evangelists. He also suggests helping fans setting up a community, giving them tools and interacting with them often. “Stop going for the easy buck and start producing something with your life. Create, instead of living off the buying and selling of others.” -Carl Fox (From the movie Wall Street). Kawasaki explains also that great business can be built when unexpected customers use products in unexpected ways. You just have to be aware enough to notice and capitalize. There is a common theme in The Art of the Start: that starting and growing a business should be about more than just money. It should be about meaning and making the world a better place. That really resonated with me. Kawasaki ties it all together with this last chapter by showing that paying back should be the fulfilment of any successful career. 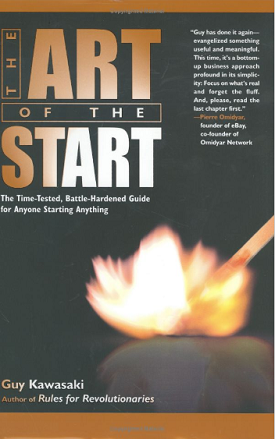 Writing this review of The Art of the Start has actually made me realized that I enjoyed the book and learned more than what I though I did when I started to write it. The Art of the Start should be compulsory reading on any entrepreneurship course, and if you are going to start a business. This entry was posted in Book Reviews, Reviews on 2013/01/20 by Justinus.